Stirrup Bar Safety Latches Up or Down? 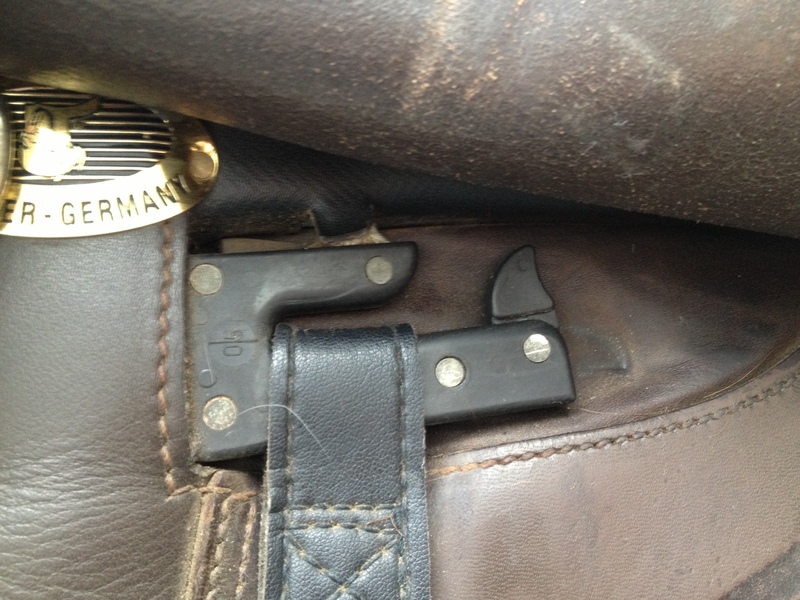 The releasable latch on the stirrup bar is called a ‘safety latch’. 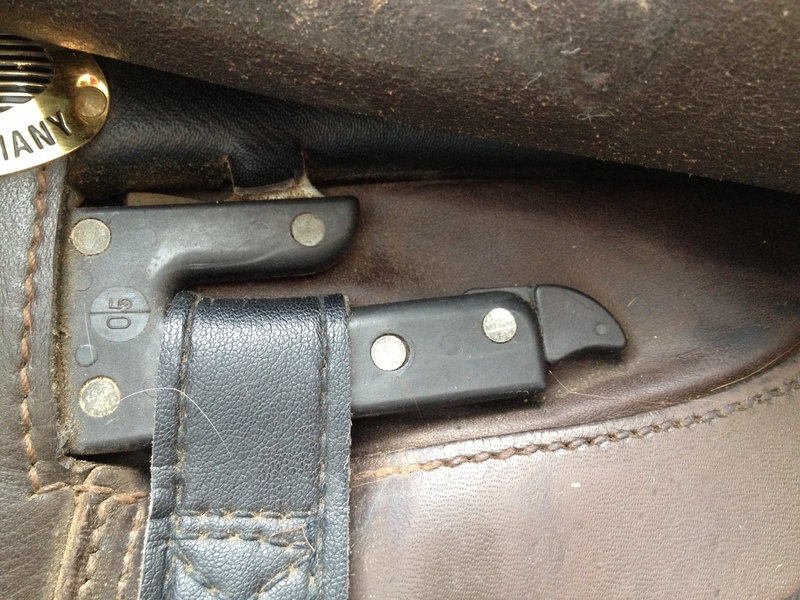 It is designed to flip up, which keeps your leathers on the bar, or down, which allows them to be removed. However, many people use the latch in the wrong position to be safe. For riding, the safety latch should be down. Always. I know, somewhere you read that they should be in the closed position to keep your leathers in place, that they will release if you fall and your foot is caught in the stirrup. I prefer not to take the chance that the mechanism won’t release. I ride with my stirrup bar safety latch down, or open, all the time. off my saddle than being dragged. Over time the mechanism can freeze up if its not regularly cleaned and oiled. I don’t know about you, but I can’t remember the last time I oiled the latch on any of my saddles. In fact, my Wintec saddle doesn’t even have a latch — the bars are curved enough to keep the leathers on, but allow the leathers to come off pretty easily. I know some people who ride with the latch closed but use safety stirrups. Me? I’d keep the latch down. Being dragged is not something I want to leave to the performance of a latch. What about you? Do you ride with the latch closed (up) or open (down)? Down. Always. Can’t think of a good reason for it to be up. I was trotting down the trail a few years ago, and I felt a tug on my leg. I looked down and saw my stirrup leather leaving the saddle. Somehow, it got caught on a branch. I grabbed it in time and laughed. I was glad it slipped off so easily. If it didn’t, I might have had a startled horse–instead, he was clueless. I had a similar thing happen when hacking back from a hunt. The leather got snagged on a branch and slipped off. Luckily, I caught it before it hit the ground. Since we ride primarily in western tack, we don’t use anything that releases the stirrup from the saddle. If you train yourself to roll on your stomach, your foot will naturally slide easier from the stirrup assuming you are wearing boots. We’ve been hung up with horse dragging us, it’s not the most fun experience. Training, both horse and rider, are the best precaution. Training the rider to roll over on the stomach and training the horse to stop when they feel the rider coming off. We work with our horses to stop when they feel a rider getting off. Where I ride I borrow an English saddle if I choose not to ride western and we have them down but to be safe we also have peacock stirrups on every saddle.